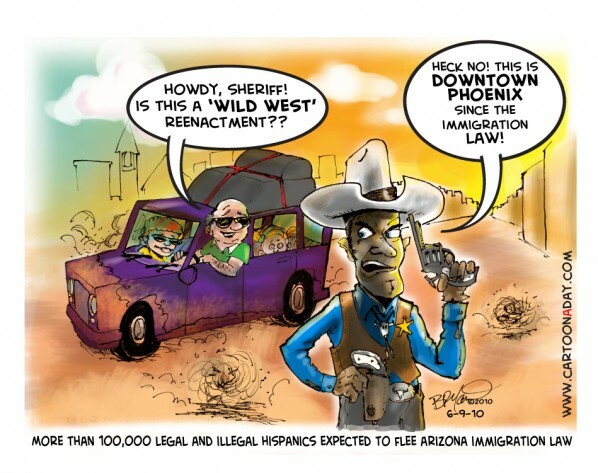 This happened back in 2007 also when Arizona passed laws that seriously and financially penalized Arizona businesses if they got caught hiring illegal immigrants. Over 100,000 Hispanics fled the State in 2007, so I’m predicting many more will leave with this most recent immigration law fiasco. The Hispanics are fleeing to States who will welcome them and where they can live in freedom. Wasn’t this country FOUNDED on the fact we fled similar persecution? I dunno. . . you decide. A sheriff stands in the middle of a dusty street at sunset in Arizona. Tourists are asking for funny directions. Inspiration: Inspired by recent events and news of persecuted illegal immigrants in Arizona.